Forty-two international students are among the new undergraduates. They come from 28 countries, a more than 50 percent jump from the number of countries in recent years. 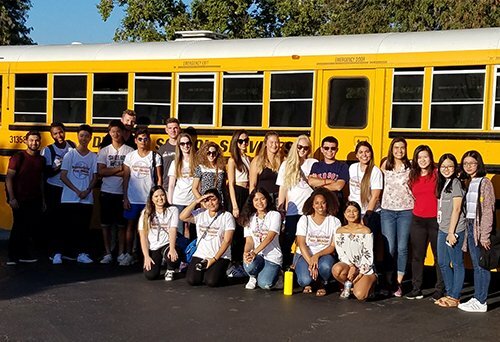 (THOUSAND OAKS, Calif. – Aug. 23, 2018) California Lutheran University is expecting its largest freshman class ever, with nearly 700 enrolled for this fall. The first-year students and 250 new transfer students are scheduled to arrive on the Thousand Oaks campus Saturday for the four-day New Student Orientation. This group of nearly 1,000 new students will begin classes with the rest of the traditional undergraduate students on Wednesday. More than 50 new Bachelor’s Degree for Professionals program students have attended their own orientation and will begin classes Monday in Oxnard, Thousand Oaks and Woodland Hills. Forty-two international students are among the new undergraduates. They come from 28 countries, a more than 50 percent jump from the number of countries in recent years. Some are from countries that haven’t been represented at Cal Lutheran before or in years, including Israel, Mongolia, Syria, Vietnam and Zimbabwe. This year’s freshman class is more diverse than last year’s. More than one in three first-year students are the first in their families to go to college, and more than half are of ethnicities that are traditionally underrepresented on college campuses. Total undergraduate enrollment is expected to be about 3,000 students, a high mark for the university. Most of the roughly 1,320 graduate students begin classes Monday or Wednesday. Classes at Pacific Lutheran Theological Seminary in Berkeley will start Sept. 4. For the first time, Opening Convocation will be held over the weekend, allowing parents to attend after moving new students into the residence halls. Combined with elements of what had been the President’s Welcome during past orientation programs, the revamped event will be held at 3:15 p.m. Saturday in Gilbert Arena. The change in schedule for Opening Convocation is one of the ways the New Student Orientation program has been altered this year to put academics at the forefront. A new session will focus on academic differences between high school and college, and a student-faculty social will give new undergraduates a chance to connect with many professors in addition to their faculty advisers. Many longtime orientation traditions remain, including painting the CLU rocks on Mount Clef Ridge on Sunday and You Got Served, which will take the freshmen to Ventura’s hills on Tuesday to do Thomas Fire recovery work. The fall semester marks the launch of two new programs, a bachelor’s degree in hospitality and tourism management and a master’s degree in management.